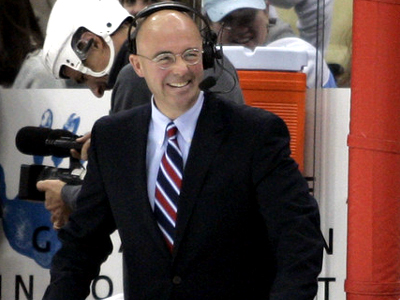 Pierre McGuire is well known in hockey circles for his over-the-top calls and player hard-ons. Hell, he even has his own drinking game. For those that have had the honour of listening to Pierre during the World Juniors or between the benches in the NHL, you know exactly what we're talking about. It seems as though Pierre McGuire knows where every hockey player was born and knows their grandparents names. His colour commentary is often useless and his love for certain players goes deeper than a mothers love for their child. Perhaps the biggest thing about Pierre are his catchphrases: "monster", "big body presence", "el-kabongo", and "fine young man" are just a few to name. Throw his random knowledge, player boners, and painful catchphrases together and you have a bonafide player ruiner. While he hasn't actually ruined any players careers, he's ruined the way we think about certain players when we hear their names. Belle's bounced around the AHL and is currently playing for Adler Mannheim in the DEL, but he did represent Canada at the 2004 and 2005 World Junior Hockey Championships. While at these tourneys, Pierre McGuire always raved about his physique. From saying he has muscles on muscles, to even discussing how he saw Belle in the locker room without a shirt on and that he has a man's body at 18. It was all very disturbing. When the Toronto Maple Leafs selected Luke Schenn at the 2008 NHL Entry Draft﻿ Pierre could barely contain himself. Schenn had been getting the Shawn Belle treatment from Pierre since the World Juniors earlier that year and was deemed a "savage physical specimen" for his physical play. However, the moniker of choice for Pierre on Luke Schenn would turn out to be the "Human Eraser." 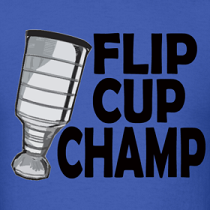 What a horrible nickname, especially since Schenn often looked like a practice cone out on the ice. Has Pierre McGuire ruined the way you think about certain players? Every article you write should be about Pierre. I am kinda glad he has left TSN. NBC can keep that creepo.